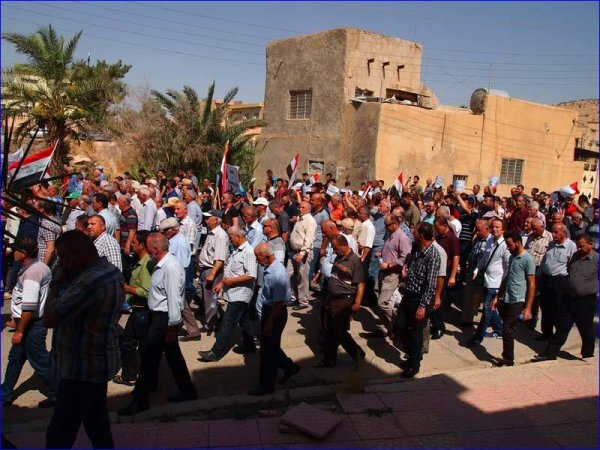 Assyrians gathered in the town of Alqosh in Iraq’s Nineveh Plains yesterday [23 July 2017] to voice their disapproval of the recent expulsion of Assyrian mayor Fayez Abed Jawahreh from his role. Though no supporting evidence was provided, Jawahreh was accused of corruption and misusing public office by the head of the Nineveh Province Council. He was subsequently removed from his position, a position to which he had been democratically elected. In addition to those who came out to protest this injustice in Alqosh, members of the Assyrian diaspora also assembled outside the Kurdish Regional Government office in Stockholm to voice their discontent. A large demonstration was held yesterday [23 July 2017] in the Assyrian town of Alqosh, situated in Iraq's Nineveh Plains, to protest the ouster of the Assyrian mayor, Fayez Abed Jawahreh, who was voted into office in 2014. Mayor Jawahreh has faced several Kurdish-led attempts to unseat him. The decision to depose him was taken on July 16 by Bashar Al Kekee, the head of the Nineveh Province Council and a member of the Kurdish KDP party, led by president Massoud Barzani. Alqosh will now be administered by a Kurd, Adel Amin Omar, who is a member of the Kurdistan Democratic Party. Al Kekee accused Jawahreh of corruption and misusing the public office but did not present any evidence to support his claim. Furthermore, he took the decision without consulting the rest of the provincial council, according to sources on the ground. The decision has been appealed to a federal Iraqi judge on the basis of violation of council procedures. Many see the move as part of a Kurdish plan to include areas outside of the Kurdish Regional Government (KRG) in the independence referendum announced by Kurdish president Massoud Barzani, scheduled for September 25. The district of Alqosh borders the Kurdish region but is under the jurisdiction of the central government of Iraq. Most of its inhabitants are Assyrians, with a smaller percentage of Yazidis. The district forms the northern part of the wider Nineveh Plains region, which Kurdish leaders openly seek to annex to the the Kurdish region. After the news of the removal of the Assyrian mayor spread on social media Assyrians held simultaneous protests in Alqosh and outside the KRG office in Stockholm.